Fall is finally here in Door County and the weather has been superb. Warmer than normal temperatures this year have kept the outdoor activities like hiking or biking through the Door Peninsula going strong. The colors on the trees are starting to change and the smell of pumpkin spice is everywhere. 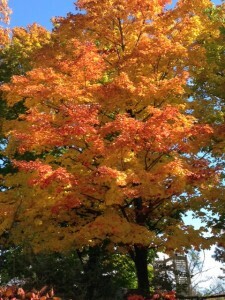 If you’ve never been to Door County in fall, you are missing a very special time of year. Door County fall events bring an excitement to the air and one of the highlights of fall is happening this weekend – Sister Bay Fall Fest. Sister Bay Fall Fest is Door County’s end-of-season bash. The Festival features a parade at 11am on Saturday, live music throughout town, street food, arts and crafts fair, 50/50 raffle, classic auto show, an adult Big Wheel Rally at 10am Saturday, and children’s activities. For more detailed information, visit cometosisterbay.com. Looking for a few other activities while you’re staying with us? Saturday, October 14th at 4pm and 8pm enjoy “Naked Radio” performed at the Door Community Auditorium in Fish Creek. For more information or to purchase tickets, visit www.northernskytheater.com. A video clip below lets you explore what’s in-store. October 13th and 14th, located in Jacksonport, Mr. G’s Logan Creek Grille is hosting an Amish Quilt and Craft Show from 9am to 5pm. On Saturday, October 14th from 10am until noon enjoy “Autumn at Anderson Pond” in Ephraim. This will be a one-mile walk on relatively even terrain which will highlight the natural splendor of the fall foliage and fungi that can be found throughout Ephraim’s Nature Preserve at Anderson Pond. www.doorcountypulse.com/event/autumn-anderson-pond-walk/. As you can see, these are just a few of the exciting Door County fall events happening this weekend. For a full detailed calendar with many more activities listed, please visit www.doorcountypulse.com/events/.